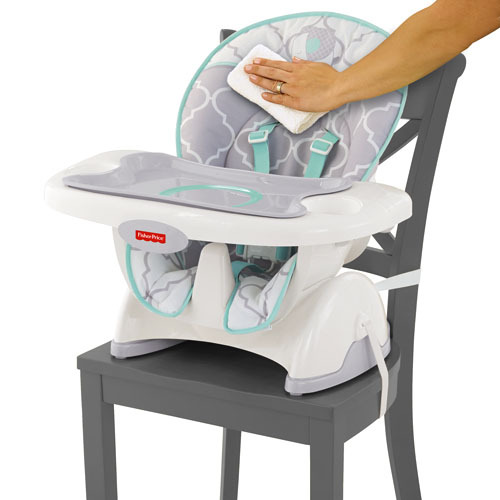 Fisher-Price Deluxe SpaceSaver High Chair straps securely to just about any kitchen chair, dining chair or restaurant chair to give you and baby all the features, comfort, and convenience of a full-size high chair in only half the space! Three height adjustments. Three recline positions. EZ Clean straps that resist spills and stains. Removable, dishwasher-safe easy clean feeding tray insert. Machine-washable seat pad and 5-point restraint—and that’s not all! 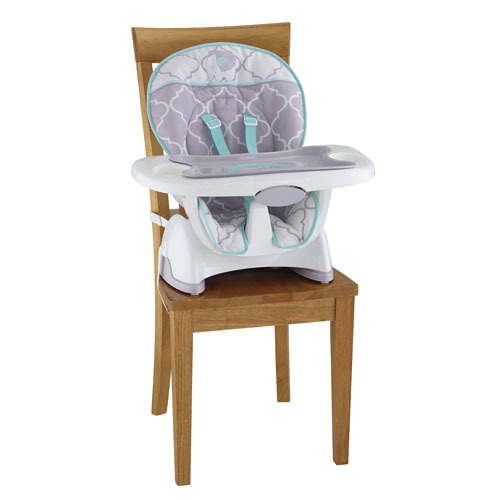 This deluxe baby high chair “grows” with baby from a reclining high chair seat for newborns, to an upright high chair seat for infants, to a comfortable, height-adjustable “big-kid” booster seat for toddlers! Its compact size makes it perfect for use in small spaces, or on the go. To Recieve updates and possible rewards for Fisher Price Deluxe SpaceSaver High Chair please sign in. To Recieve updates and possible rewards for High Chairs please sign in.